Ah, spicy chocolate. That concept was completely unfamiliar to me until I met Sonia. She and her friends introduced me to Abuelita our first Christmas season together, and I've been having it each December since. Turns out, Trader José has his own spicy hot chocolate, and it's worth a purchase as well. But here we have chocolate guajillo, jalapeno ganache, chili lime, and habanero chocolates—like actual candies with different kinds of chili in them, just in time for the holidays. Sounds pretty exotic...good thing I'm feeling adventurous today. First up, Milk Chocolate Guajillo: Amazing. For a second, it just tastes like very sweet, ultra-smooth milk chocolate, but wow. Wow. A few moments in, there's this delightful warmth that skates across your tongue and glides down the back of your throat. It leaves your mouth tingling long after it's done. I loved it. 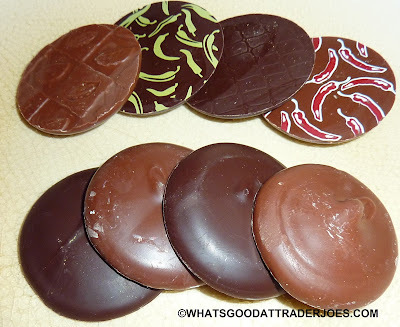 Next, Jalapeno Ganache: Where have I heard that word "ganache" before? Oh yeah. That bacon-infused nonsense. Apparently, it's like a chocolate cream sauce. Well, not only is this ganache pork-free, but it's also got a jalapeno-esque kick and happy little green jalapeno chilis printed right on the candy. If you ever wanted to know what a chocolate-covered jalapeno would taste like, this is probably pretty close. Not my favorite, but I feel just a bit more urbane and sophisticated for having tried it. Then there's the Chili Lime chocolate: Outstanding. Never had a chocolate candy like this before. The "zesty lime oil" is tart, tangy, sweet, and simply awesome. Blended with chili, caramel, and chocolate, the lime flavor still stands out as dominant. It was an experience I won't soon forget. Finally, there's Habanero Milk Chocolate: With an impressive amount of heat, this red chili-printed chocolate also features ganache. When I heard the phrase "chili chocolate," this is the flavor I imagined. It's sweet, it's chocolatey, and it's most definitely spicy. It's certainly not bad, but I think my favorite flavor was the chili lime, followed closely by the guajillo. Sonia wasn't as big on the chili lime, but she raved about the guajillo. This habanero flavor was her second favorite. At $4.99 for 16 candies, they're not exactly giving them away, but this would make a great gift for any adventurous chocolate lover, and I can't emphasize the high quality of this product enough. And most other comparable chocolate collections are much pricier elsewhere. Four stars from me. Four and a half from the lovely Sonia. I'm hoarding a few of these as holiday hostess gifts. So pretty and presentable! If this doesn't give me heartburn nothing will! Well, off to my local TJ's to stock up! Can't wait to try! We love spicy stuff. Fellow TJs shoppers and I really appreciate your reviews. There are two guys who helm this blog; Nathan & Russ. Sonia is Nathan's wife; Sandy is Russ' wife. I just bought these chocolates today and I love the guajillo ones.